Here in Maryland today, the sun is shining and the wind is gusting. It is beautiful, but gusty wind can sometimes cause problems with hanging feeders. 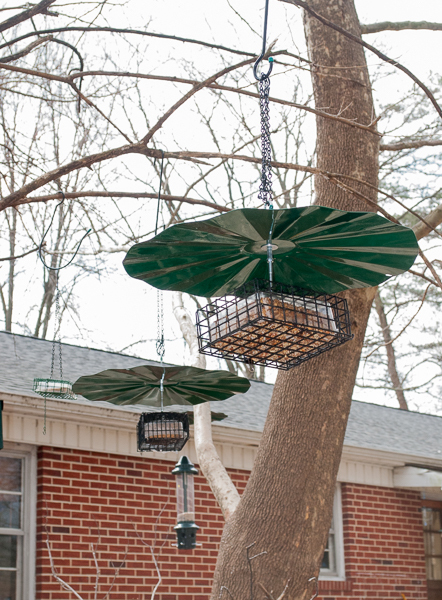 If you’ve got both hanging bird feeders and squirrels in your yard, you probably have baffles as well. Get the right baffle and you can succeed in both keeping squirrels out of the seed and keeping the feeder a little more protected from wet weather. But while this type of baffle can be great, when you add gusty winds to the mix, things can get very interesting. How do you keep the baffled feeder from kiting around in the wind? In my yard, I have a lot of bird feeders and almost all of the hanging feeders are baffled in some way. Three are covered by metal or plastic weather domes. 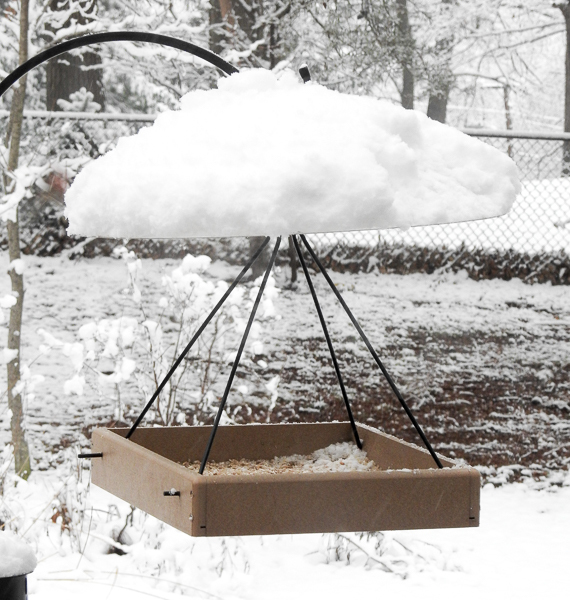 I haven’t found this type to be at all useful in keeping out squirrels, but they can be nice for protecting seed in hanging platform feeders from getting quite as wet when it rains or snows. (They do better in light rain; the seed will still get wet in heavy rain or when the wind drives the rain sideways and the seed can get buried in heavy snow.) 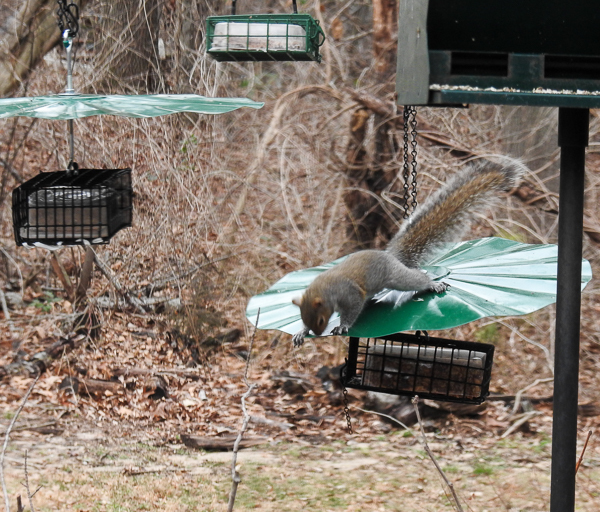 I only use domes on pole-mounted feeders that are protected from squirrels below by a pole barrel baffle. My absolute favorite baffles, which I HIGHLY recommend based on my own experience with them, are the Erva metal hanging baffles. (Erva baffle on Amazon.) You may remember that I’ve talked about these before. I have them on all my hanging tube feeders and on several of my hanging suet feeders as well. Their solid metal construction prevents squirrels from chewing them and their wide diameter keeps squirrels from getting past them and down onto the feeder below (as long as the feeder itself isn’t really wide.) In my experience, these will keep squirrels off feeders as long as you position the feeder outside of the squirrels jumping range so that they can’t bypass the baffle from the side or below. While not inexpensive, they pay for themselves in birdseed that doesn’t go into a squirrel’s belly. This baffle’s thin side profile also makes it less in-your-face visually than typical bird feeder domes. I have found a downside to baffles though. They are fine in a breeze and even on a moderately windy day. But when strong or gusty winds hits the baffle the right way, the wind can pick it up, causing the feeder to lift up in the air unexpectedly, snap over to one side and then drop back down. While I’ve never seen a bird hurt in this way, it surely does freak out every bird around when heavy objects start swinging around in violently unexpected ways. So what to do? I have two strategies. If the weather folks are calling for really high winds (tropical force or hurricane for example), I take down the baffles (and probably the feeders as well) for the duration. While birds do feed on rainy days, when it really pours down rain and things get crazy windy, they are probably hunkered down in protected spots anyway and not out at the feeders. But on days where the winds gust periodically to maybe thirty or even forty miles per hour, I’ve found that often my second strategy is enough: adding weight. I’ve noticed that my heaviest feeders tend to kite around much less in the wind. In fact, the very light-weight suet feeders that I’ve baffled are the feeders most likely to really go crazy in the wind. So when a windy day comes around, I make sure that all my seed feeders are full to keep their weight up. These are usually fine then. They might sway a bit in the wind but they don’t usually do anything violent and the birds seem fine with it. 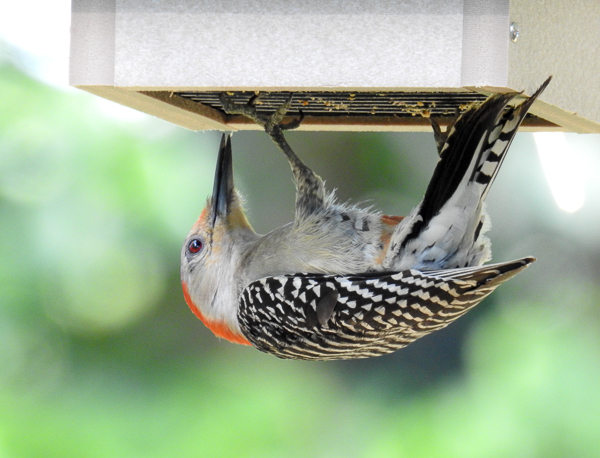 The baffled suet feeders are pretty light-weight and a typical suet block isn’t that heavy. The feeders I’m using are the Birds Choice feeders that look like little houses. 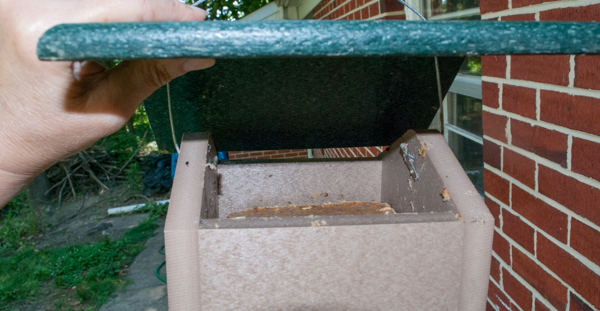 To fill them, you lift the roof and drop a suet cake inside and replace the roof. There is actually a lot of room in these feeders, so when it is windy, I drop a second suet cake on top of the first. The combined weight of this doubled stack of suet is often enough that I don’t have to completely take down the baffle or even take down the whole feeder. It might wiggle around in the wind, but usually the added weight is enough to keep it from going completely crazy and the birds can still use it. Problem solved. Hope you find this helpful in your yard! A Raccoon is Eating My Suet!